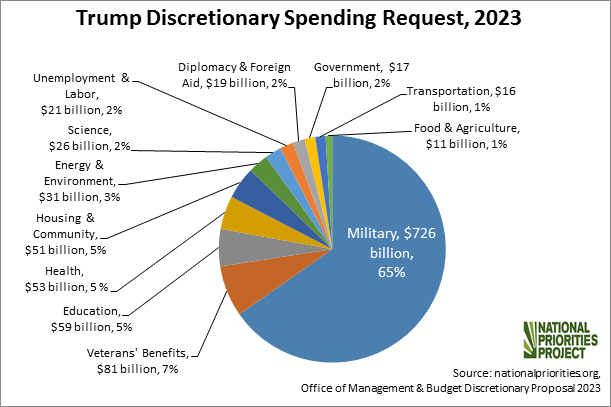 By 2023, the final year included in President Trump's budget request, military spending would make up 65 percent of the federal discretionary budget, compared to 54 percent in 2018. Nonmilitary discretionary spending would plummet 35%, from $591 billion in 2018 to $387 billion in 2023. Military spending would continue its rise, up 4 percent from $700 billion in 2018 (already an 8 percent increase over the last Obama military budget) to $726 billion in 2023. 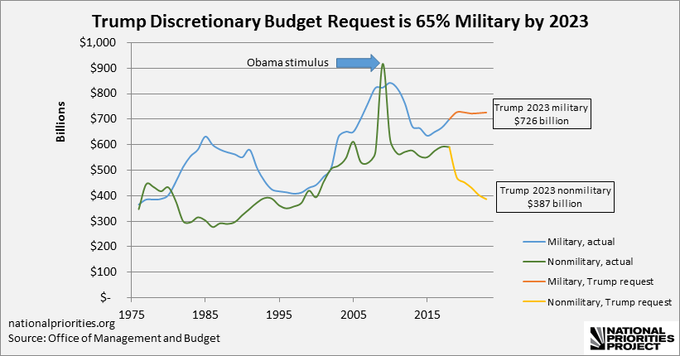 The last time military spending made up such a big share of the discretionary budget was in 1989: the year the Berlin Wall fell, "The Simpsons" debuted, and Taylor Swift was born.